Solidwave specializes in taking a design or concept and bringing it to life in the form of a photorealistic representation. We can transform anything from a sketch to a 3D model. All modelling work is done in Solidworks and can, therefore, be used to aid the design and manufacture process. These models are then used to create realistic images, animations and interactive tours for the client. Web Site Snapshot: If available, above is a snapshot of the Solidwave Ltd web site at http://www.solidwave.co.uk as it appeared when this site was added to the directory or last verified. 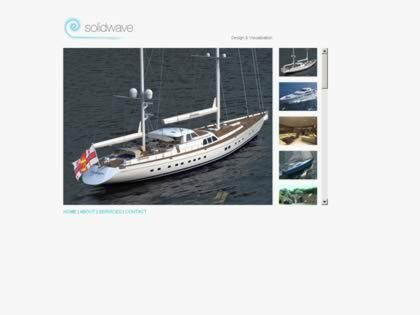 Please Note that Boat Design Net has no involvement with the above web site; all content and images depicted in the above thumbnail are the property and copyright of Solidwave Ltd unless otherwise noted on that site. Description: Solidwave specializes in taking a design or concept and bringing it to life in the form of a photorealistic representation. We can transform anything from a sketch to a 3D model. All modelling work is done in Solidworks and can, therefore, be used to aid the design and manufacture process. These models are then used to create realistic images, animations and interactive tours for the client.